Today is one of those days where the journey is as integral as the destination. There is a drive of several hours to Pondicherry, the former French colony further down the East coast. Along the way we stop for chai. 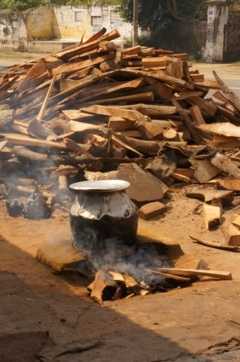 The staff are prepping for lunch, shelling huge mounds of prawns and cooking a huge vat of rice over an open fire in the dirt yard. Across the road a stack of clay pots is piled up in front of a couple of small huts. 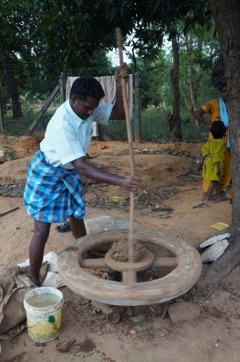 The potter comes out and chats with our guide for a few minutes, then beckons and heaves on a heavy stone wheel. 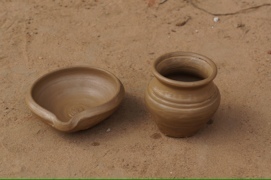 He uses a stout wooden pole to get it spinning, then adds clay and in a few minutes has made a series of bowls, jugs and teacups for us to admire. 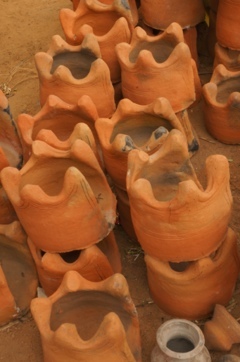 His earlier work, some fired and some still drying in the sun, is stacked up to one side, including a stack of open terracotta stoves that remind me a bit of the “hobo stoves” I used to make from Milo tins to cook toast on in the garden as a child. Behind him, under a tree, the potter’s family are observing us, one girl of about twelve playing on a smartphone. There is one more scheduled stop before we arrive in Pondicherry – Auroville – and its inclusion has been the source of some controversy within the group. To lighten the mood and pass the time, the more cynical among us begin a game of Auroville Bingo (points are allocated for long matted hair, especially on Western guys, tie-dyed clothes, baggy hippie-pants and ageing hippies generally). Auroville is a kind of alternative community, or in fact group of communities, established in the late sixties by a French woman known these days only as “the Mother”. At its heart is a giant sphere, the Matrimandir, which looks like a large metallic golf ball, a version of “futuristic” that was well out of date by the time it was completed in 2008 (after 37 years of construction). The basic founding principles, that the community find more sustainable ways of inhabiting the planet and that it be for all creeds and all nationalities, were almost before its time, but the way that this has manifested feels a bit odd and exclusive – one may view, but not enter, the Matrimandir, though one may certainly spend one’s money at the boutique or in the cafe (which serves delicious salads and pizza, amongst other things), and the short audiovisual presentation has a portentous semi-religious tone which raises my hackles from the start. On the other hand, there is a small but impressive display of renewable energy and sustainability projects in the next room. 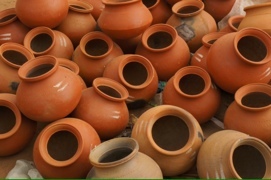 There is not a lot of visible information about how the various projects work, or the day-to-day life within the various sub-communities, so there is little to counterbalance the feeling that it’s all a bit elitist – an impression heightened by the poverty immediately outside its gates. In a way I don’t think I was there long enough to form more than a superficial opinion – I can admire the basic principle, but the religious reverence accorded to “the Mother” is a bit creepy and, without more information, for a skeptic like me it’s hard not to dismiss this as an eccentric relic of a bygone era – but that’s the nature of group travel: I’m not on my own timetable, so I can’t take time to meet any of the people who actually live here and find out more. And besides, I’ve just spotted an old stoned white guy on a scooter with baggy tie-dyed purple trousers and dreads. Bingo! On that note, I may not be in the most positive frame of mind when we finally hit Pondicherry. 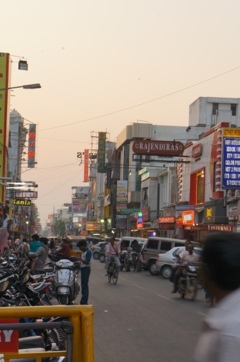 Our hotel is on a busy street that could be anywhere in India. My requests for boiling water are met with nods and inaction – though eventually a lukewarm bucket is brought to my door, the bearer standing there clearly expecting a tip. Better luck at the next hotel, maybe? The offending bag is placed in quarantine. Before we are let loose on the town, we are taken to a local temple dedicated to Ganesh, Sri Manakula Vinayagar temple, with a sad temple elephant swaying outside. Inside, there are a series of friezes around the walls, and a queue for the inner sanctum. We attract a few hisses and some angry words, which I get the distinct impression is because one of our number is wearing a very skimpy top and short shorts – not quite the covered knees and shoulders that etiquette requires – but she remains happily oblivious. Leaving the temple, we walk to the French quarter of Pondy, which is quite a contrast to the rest of the town (though somehow smaller than expected). The streets are broad and uncluttered, and some of the buildings still have a little French style. There are cycle rickshaws everywhere, the first time I’ve seen them. We stop near a beautifully kept property with high walls, concealing a colourful garden full of flowers. 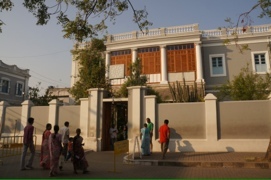 This is the Sri Aurobindo ashram, founded in the 1920s. Sri Aurobindo was a nationalist-turned-guru, who eventually passed leadership of the ashram to the Mother, of Auroville fame. Inside there is near silence, as people sit in quiet contemplation in the garden around what looks to be Sri Aurobindo’s tomb. Leaving the ashram, a few of us turn towards the waterfront, passing a huge, heavily guarded building flying the red, white and blue of the French flag. The embassy seems to be all that is recognisable of the former colony, save for a branch of the Alliance Francaise and a couple of bakeries selling pain au chocolat. Sadly, the madeleine I order at Le Cafe on the promenade turns out to be just a slightly stale muffin which bears no resemblance to the French treat. Along the promenade, locals and tourists stroll, to the sound of hawkers selling candy floss and seaside toys (though it’s a rocky promenade, not a beach, and the waves are crashing powerfully enough against those rocks to prevent so much as dipping a toe in the sea). 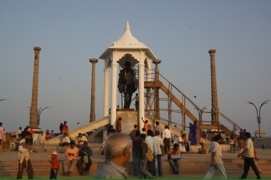 There is a huge statue of Gandhi, garlanded with marigolds, beside which a staircase has been constructed to facilitate the addition of further garlands. 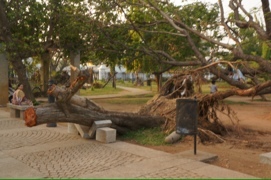 Turning back towards town, we pass through a park, where the effects of the January cyclone is clearly visible, with uprooted tree trunks still lying across broken marble benches where they fell. It is a noisy, dusty walk of twenty five minutes or so along busy streets to find the hotel, stopping on the way at a stationer’s to buy boxes of pencils (there has been much discussion about what, if anything, is appropriate to give to children we may meet along the way, and there is a chance that we’ll visit a school at some point on the trip), and then to an “English wine shop” to buy a small thank-you present for our guide – these shops are usually to be found by looking for a queue of men and a shopfront covered in steel bars; judging by his reaction I suspect we may be the first women that the guy working in the shop has ever served. 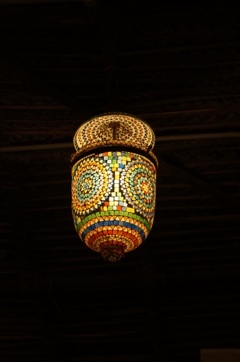 I’m sure there is more to Pondy than first meets the eye – the restaurant a few of us go to that evening (Satsanga) is lovely, set in a garden hung with coloured glass lamps, and the ashram was a surprisingly peaceful place – and as I will discover elsewhere in India, first impressions are not always reliable, and much depends on my own frame of mind. Worth maybe another day or two, perhaps.